The Legislative Committee, including representatives from all 24 boards, holds monthly meetings to guide the association’s lobbying activities in Annapolis, and invites policy and legislative leaders as guest speakers to exchange ideas. During the legislative session, MABE’s bill testimony reflects the association’s resolutions and legislative positions as adopted by the membership. For additional information, contact John Woolums, MABE’s Director of Governmental Relations. MABE’s Legislative Committee meetings are held in the MABE office on Monday mornings, 10:00 to 12:00, unless otherwise indicated. Meeting agendas and materials are posted in advance of the meetings, and updated regularly. 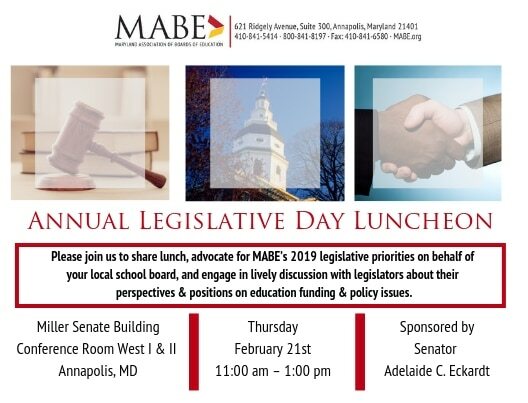 Feb. 21, 2019 – MABE’s Annual Legislative Day Luncheon will be held from 11:00 a.m. – 1:00 p.m., at the Miller Senate Building Conference Room West I & II, in Annapolis. The Miller Senate Building is located at: 11 Bladen St, Annapolis, MD 21401.